The heavens do indeed declare the glory of God, but some people choose to believe that the heavens appeared by random chance out of nothing—a stance for which they are “without excuse.” Paul so forcefully points out in Romans 1:18-20 that who God is can be understood “by the things that are made.” These people tend to support their beliefs with various scientific models such as the radioactive dating methods we have been examining in this series. This article will address the uranium-lead (U-Pb) and thorium-lead (Th-Pb) models. Uranium and thorium are both members of the actinide series of elements. Elements in this series progressively fill the 5f electron orbitals and thus have similar electron configurations. Since the chemical properties of an element depend upon its electron structure, members of the actinide series have similar chemical properties. Thus, they can substitute freely and extensively for each other. 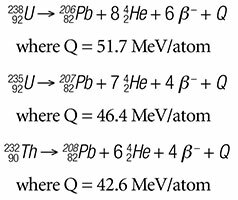 This means that as 238U, 235U, and 232Th proceed through their decay chains, they can easily become separated from their final daughter isotopes, 206Pb, 207Pb, and 208Pb respectively. This is especially true for the radon (Rn) gas daughters of each decay chain, which are in the gaseous state at temperatures above -71 °C, in each decay sequence. If that separation distance is larger than the sample size, then significant error will be introduced in any attempt to date that rock formation because the correlation between parent and daughter has been broken. The early 20th century experienced a rush to use these decay sequences as clocks for measuring the ages of rocks in which they were found. Five basic methods were tried that depended on the accumulation of He or Pb in the rock formation being dated. The rock formation from which the samples were taken has remained a closed system to U, Th, Pb, and all intermediate daughter isotopes throughout its history. The initial concentration of either the daughter or parent isotope can be definitively determined. The decay rates of U, Th, Pb, and all intermediate daughter isotopes have remained constant throughout the history of the rock formation. That the earth is old enough for the extremely low decay rates of 238U, 235U, and 232Th to have produced measurable levels of the final daughter isotopes 206Pb, 207Pb, and 208Pb respectively. And finally, that all parent and daughter isotopes are uniformly distributed throughout the rock formation. As pointed out in previous articles of this series, these assumptions are tenuous at best, and the methods do not reproduce known ages of rock formations. Since these are the primary methods for establishing the age of the solar system, a new question arises: Where do the heavier elements in the periodic table come from? Nuclear physics tells us that there are only two ways that heavier elements can be produced from lighter elements—by nuclear transfer reactions and/or nuclear fusion reactions.5 But nuclear transfer and fusion reactions are only self-sustaining if they are exothermic (i.e., if they give off energy). This means that they cease to produce heavier elements unless they are part of a system that produces enough energy to drive the reactions forward when they become endothermic (i.e., when they need energy to proceed). Stars are the only known objects in the universe that can potentially do this. Self-sustaining fusion in stars is only possible for elements below iron in the periodic table. Now another subtle assumption creeps into the radioisotope dating paradigm. It has been hypothesized that the heavy elements in our solar system come from a cluster of supernova explosions about ten million years ago that produced a “local bubble” around our solar system.6 All heavy elements supposedly came from this explosion, which left a peanut-shape region of space approximately 300 light-years long and containing gas at roughly one million degrees. Many questions now arise. How has a gas in interstellar space remained at one million degrees for ten million years? What is the link between this hot gas bubble and supernovas? How did such a low residual density of gas (0.001 atoms/cm3) “seed” the relatively large amounts of heavy elements currently observed in our solar system? Finally, it would take approximately 1.8 x 1010 kJ/mole to form one mole of 238U by fusing four V atoms—a highly improbable reaction to begin with. How does a supernova generate this kind of energy to form not just 238U but all the elements heavier than iron? Perhaps “the heavier elements are primordial” is a better explanation. Origins of the heavy elements, cosmological production of the parent and daughter isotopes, and migration of the intermediate daughter isotopes in these decay chains make Method 4 suspect and certainly not a methodology that meets the criteria for scientific fact. Our next article will take a closer look at Method 5. Faure, G. 1986. Principles of Isotope Geology, 2nd ed. New York: John Wiley & Sons, 44-45. 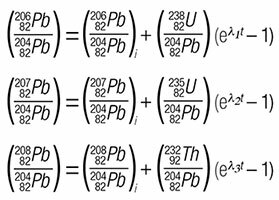 Secular equilibrium is a condition in a radioactive decay chain where the rate of growth of the final radioactive daughter is equal to the rate of decay of the parent that initiates the decay chain. Humphreys, D. R. et al. Recently measured Helium diffusion rate for Zircon suggests inconsistency with U-Pb age for Fenton Hill Granodiorite. EOS, Transactions of the American Geophysical Union. 84 (46), Fall Meeting Supplement, Abstract V32C-1047, 2003b. Humphreys, D. R. et al. 2004. Helium Diffusion Age of 6,000 Years Supports Accelerated Nuclear Decay. Creation Research Society Quarterly. 41 (1): 1-16. One type of nuclear transfer reaction begins with two nuclei that collide and, in the process, exchange mass to produce two or more different nuclei; this is called a nuclear pick-up reaction. A good example of this is , where a proton is picked up by the beryllium atom to become a boron atom and a gamma ray. A nuclear fusion reaction begins with two nuclei that collide and become one much heavier nucleus. A good example of a nuclear fusion reaction is , where a helium nucleus fuses with an oxygen nucleus to form a sulfur nucleus. These are the types of reactions that we believe fuel stars. Phillips, T. Evidence for Supernovas Near Earth. NASA Science /Science News. Posted on nasa.gov August 26, 2014, accessed February 15, 2015. Cite this article: Vernon R. Cupps, Ph.D. 2015. Heavy Metal Clocks, U-Pb and Th-Pb Dating Models: Radioactive Dating, Part 7. Acts & Facts. 44 (5).